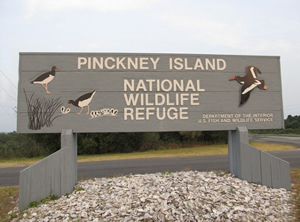 Fishing pier, lighthouse, reservable picnic shelters, (5) five miles of beaches. The refuge is located in Beaufort County, South Carolina and is 1/2 miles west of Hilton Head Island off of U.S. Highway 278. The island is bounded by Skull Creek (the Intracoastal Waterway) on the east, Mackay Creek on the west, and its northern tip faces Port Royal Sound. 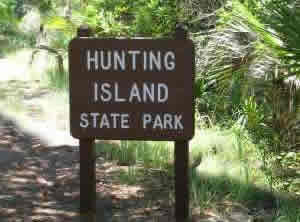 From I-95, take SC Exit 8 east towards Hilton Head Island approximately 16 miles to the entrance gate on the left. Areas in Beaufort County, South Carolina include; Beaufort, Burton, Bluffton, Dale, Frogmore, Hilton Head Island, Laurel Bay, Lobeco, Parris Island, Pocotaligo, Port Royal, Pritchardville, Sheldon, Sun City Hilton Head, Seabrook andf Yemassee. Bodies of brackish and saltwater in Beaufort County, South Carolina include; Albergottie Creek, Archers Creek, Atlantic Ocean, Ballast Creek, Bass Creek, Battery Creek, Beaufort River, Big Island Creek, Bird Island Creek, Boatswain Pond Creek, Brickyard Creek, Broad River, Broomfield Creek, Bull River, Calibogue Sound, Cat Island Creek, Chechessee Creek, Chechessee River, Coffin Creek, Colleton River, Combahee River, Cooper River, Coosaw River, Cowen Creek, Distant Island Creek, Eddings Point Creek, Euhaw Creek, Fripp Inlet, Habersham Creek, Harbor River, Haulover Creek, Hazzard Creek, Hoophole Creek, Huspa Creek, Jenkins Creek, Lucky Point Creek, May River, McCalleys Creek, Moon Creek, Morgan Back Creek, Morgan River, Moss Creek, Mulligan Creek, Old House Creek, Parrot Creek, Pocotaligo River, Port Royal Sound, Ribbon Creek, Rock Skull Creek, Savage Creek, Springs Creek, Staion Creek, St Helena Sound, Story River, Trenchards Inlet, Village Creek, Ward Creek, Whale Branch, Wimbee Creek and Williman Creek.